♥ Mama 2 Multiples ♥: Soft Scrub 4-in-1 Toilet Care Review & Giveaway! Soft Scrub 4-in-1 Toilet Care Review & Giveaway! I'm a huge fan of Soft Scrub products! I have yet to find one product from this company that does not satisfy me. Their brand is wonderful and all of their products are of top quality. That's why I was so excited to get the opportunity to review yet another Soft Scrub product through my work as Purex Insider! 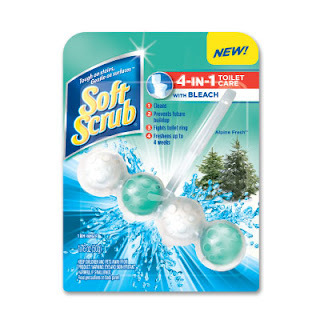 Soft Scrub's newest product is their Soft Scrub 4-in-1 Toilet Care! I know what you're thinking just by looking at the above photos...what's so great about this thing, right? Trust me, these things are so darn cool! Regardless, this new product is ridiculously easy to use. It simply hangs on the rim of your toilet bowl, and you leave it alone. The rest of the work is up to the product! Water activates the product with each flush of the toilet, keeping your toilet clean, preventing future build up, fighting toilet ring, and freshening for up to 4 weeks! I was skeptical at how well this would work at first, but it proved me wrong and showed me just how good of a job it does at keeping our toilet cleaner than it has even been, and allowing less moments of me breaking my back, bending over and scrubbing the toilet every other day! Even better than the 4 week freshness and less cleaning this product provides? It costs less than $2.00! How can you beat that?! 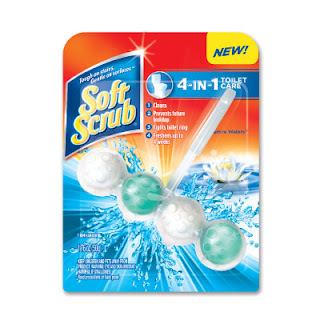 Soft Scrub's new 4-in-1 Toilet Care can be purchased at Walmart! WIN IT: THREE lucky readers of Mama 2 Multiples are going to WIN a FREE Soft Scrub product! To enter, simply fill out the form below and follow the instructions! Sent follow request on Linkedin Claudia N.
Soft Scrub 4-in-1 Toilet Care Giveaway WINNERS! Dial Kids Body and Hair Wash Giveaway WINNERS! Pampers Sweet Sleep Time Review & Giveaway! Dial Kids Body and Hair Wash Review & Giveaway!